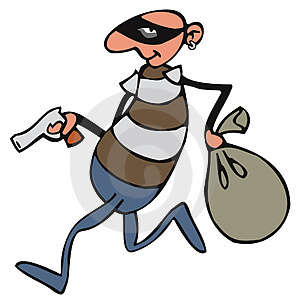 Cheaters Never Prosper…unless they steal a lot of eaves! Seems to be a growing concern that thieves are loose on Empire Avenue. Evidently lots of folks are taking the eaves from missions without doing the requested tasks. I am relatively new; so I can’t say if the problem is truly worse or if mission creators are just whinier. The infrequent checking I do for my missions shows me a completion rate that ranges from 100% to 25% with somewhere between 75% to 80% as my norm. I suspect that the low rate of completion was mostly my fault. By the way I set up a mission and when I launch it, I believe that I can get a reasonable completion rate. At 75% completion, I really was not all that concerned about folks stealing missions. I trusted God or Karma to punish the sinners with the help of a few blocks from me & my friends. A few days ago it seemed like every mission had a “don’t steal my eaves” warning, and I was slightly annoyed. That seemed like a waste to me; so I ran a quick sort of snotty mission ranting about folks ranting about mission thieves. I had to set a target for the mission; so I sent folks to this G+ post. My intended point was that I didn’t think telling cheaters not to cheat was all that effective a strategy. My mission title, “Steal my Eaves,” was intended to be a bit of a satirical poke at all the “don’t steal my eaves” warnings. Much to my surprise a ton of folks actually went to the post, commented, and shared. That left me feeling a bit guilty about my smart mouthed attitude and the obvious pain around this issue. As the discussion continued, I promised to try to bring the Avenue’s management into the discussion if there were any good ideas to solve the problem. An elegant solution for my semi-jerky behavior. Mission Block-Although you can block someone today on EAv, that involves breaking all contact and mutual disinvestment. The problem is that a large investment lets you steal with impunity. The penalty is very high if you block a large investor. Most folks do not want their price to go down that much. Gated Mission-Some folks call it a two step mission. In order to get paid for a mission, the mission creator would have to approve the payment or allow some time limit would expire. That would give the opportunity to check the task completion. Undo or un-accept mission button-Sometimes folks can’t complete a mission for technical, ethical or simply fit reasons. Since there is no way to ‘back out’ in the current mission structure, decent folks end up stealing a mission. Reputation Rating-An ‘Ebay-ish’ type system where there could be some public way to identify folks who struggle with ethical lapses completing missions. I also notice a possible additional issue that might need a bit of attention from the EAv management. Some folks are selling eaves for actual currency. You may have noticed some odd, high reward, private community missions. With no evidence, I suspect that there may be a new incentive for mission theft called cash. There are a lot of games in this game! I wanted to thank everyone who posted, tweeted, shared, & thought about this issue. Even Dups weighed in with a couple of tweets. Lynn O’Connell articulated most of these ideas for reducing mission theft. With all this said, I do think that mission creators can help themselves with well designed missions launched at optimal times. I guess that I will leave that for my next post. In Texas, we call that baiting the hook!